Trudging up yet another terraced rice field in Western China in search of the Xani people. 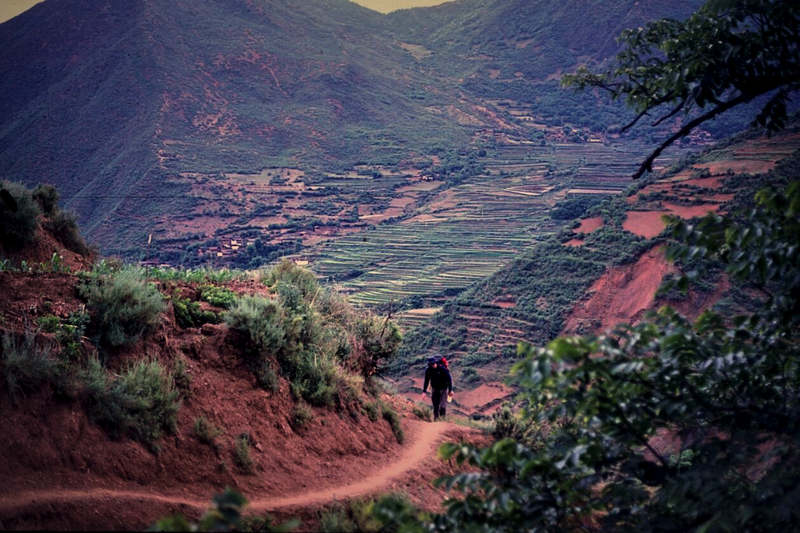 It was in these remote mountain villages I learned to chase the roosters from the public latrine before…well, you know. James Yates Photo. 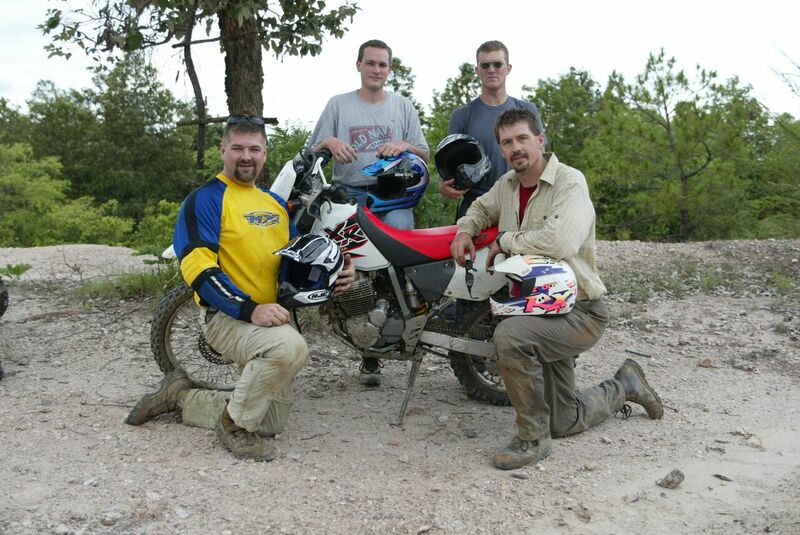 An old and influential friend died yesterday and the best way I know to honor my friend is to reminisce about the good times. My friend actually isn’t a person, it is – or was – the communications department of the International Mission board made up of extremely gifted people who became my friends. At one time, many of these friends, before I knew them as friends, bordered on being my idols. I read their stories, I gazed endlessly at their photos and let their videos wash over me. I wanted to be like them. 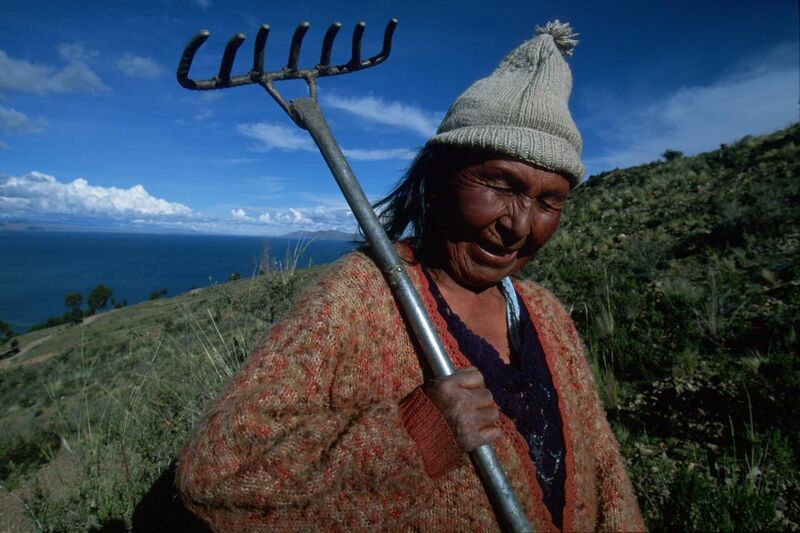 The Aymara live high in the Andes Mountain surrounding Lake Titicaca. They are an impoverished people with few Christians among them. The air was so thin here I thought I’d float away. Matt Jones Photo. The writers who produced copy for The Commission magazine were rock stars to me. I knew them by name and could give you a rundown of their story packages from around the world like reciting stats from the back of a Ryne Sandberg baseball card. I still can 20 years later. People like Erich Bridges, Mike Creswell, Don Martin, Craig Bird, Mark Kelly, Marty Croll, Mary Jane Welch and Anita Bowden took me places I had to find in an atlas. And then there was Mary Speidel. The awful life. 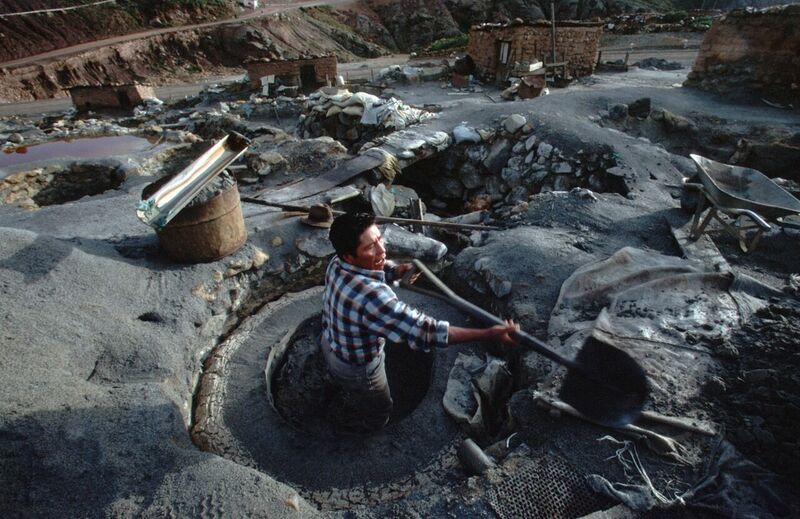 This Bolivian Quechua man shovels the mine tailing dregs. He does this every day, all day in a chemical-laden quarry. The hut where his family lives is just beyond him. He does it all hoping to score about 50 cents a day. The fumes alone nearly choked me. James Yates photo. There is a reason why many sports writers aren’t considered “real writers,” and so the impression of me when my portfolio arrived on the desk of Anita Bowden, the editorial manager, was pretty low before the envelope was opened. Fortunately, Anita was intrigued enough to have me fly to Richmond, Va., for an interview. I was not aware a group interview was part of the process so when I walked into a room with Erich, and Mary, and Mark, and Marty, and Mary Jane, and Norman Miller and Julie McGowan, I about passed out. This lineup was the Murderer’s Row of missions reporting. They were responsible for giving shape to my missions calling. In my mind they were the “Lukes” of the 20th Century, continuing to “compile a narrative about the events that have been fulfilled among us” (Luke 1:1). These were those God had called out to tell the story of how He was actively moving in cultures around the world, sharing with Southern Baptists the “certainty of the things [we’ve] been taught” about the advance of the Great Commission. And by God’s grace, I became a rookie on that team. I traveled first to Spain and then to India, where I spent three weeks with Don Rutledge. No one in the history of the world captured that nanosecond moment of human connection like Don. He never missed. All people, despite the poverty and squalor in which they lived, have dignity because they are created in God’s image. Don taught me that by watching him work and seeing his pictures. All work and no play makes Chris a dull boy. Having some big fun somewhere in Thailand with good friends Russ Rankin, Jim Yates and Guy Lyons after two weeks of backpacking Western China. What a great day that was, huh fellas? Erich taught me to do whatever it takes to get the best story. Mark, Marty and Julie taught me that even though I may think my story is art, grammar really matters. Mike taught me how to travel internationally and be a correspondent. Mary taught me to labor over the details. Mary Jane taught me the importance of seeing the larger story package. Anita taught me what it means to be an organizational communicator. People like Dan Beatty, Van Payne and Bill Bangham helped me to see stories visually, and turn what I saw into words so other people could “see” too. Life moves on and so did I. I had the opportunity to work in 37 countries while honing the gift God has given me (and to think I started out an accounting major, not that there is anything wrong with that). The communications office at the International Mission Board facilitated the opportunity, but it was the people – the people – who helped shape me personally and professionally and as a result it has altered the trajectory of my life. It’s turned out to be more than a journey. It’s been an adventure. So, today, while I grieve that I lost a friend in that department, I celebrate the many friends who actually were the department. To them, thank you. You will always be rock stars to me. Chris! I can say that we all were family there! Sharing the same heart..missions!! You did great communicating how you all are family…encouraging, and building up!! So sorry to hear the descision was made to cut the department. Beautiful, Chris. You know you are one of those rock stars who left a legacy too. I don’t have words to describe how this has touched me. Actually I had no idea that the communications department at the IMB had been shut down. The article brings back so many good memories of our past journey as a family being with the IMB. I have always been so proud of you. This just adds another level of admiration for your dedication to the Lord and, for your love to our family and to Michelle and Madison. Thank you for taking the time to put it into words. Love and Blessings to you. I can remember us praying for that opportunity to come and how excited we were when it did. You then became a rock star and I read your articles with an understanding that you would run from a bear in a heart beat (inside joke in case others read this). You are incorrect sir…It was an IMAGINARY bear. I ran from imaginary bears. They are much more dangerous than real ones. And I do remember that prayer in the parking lot at First Tennessee Bank as a matter of fact. The specific ask that I’d be offered the job while there. It happened, which is where I remember learning from you the expression, “Blab it and grab it.” However, in that case it was obvious the whole thing was orchestrated by the Lord. Appreciate that you were part of that journey. Great, heart-felt. moving eulogy!!! I too was shaped by the stories, my heart pricked by the Holy Spirit through the fotos in the Commission magazine and was awesomely inspired by the missionaries and their stories of God’s work…. how will WE know now? That was a great day for sure brother. It was a rich and rare opportunity to work with such amazing communicators reporting on God’s Kingdom work through SBC missionaries. So beautiful, Chris. I am just stunned. And grieving. Thank you so much for this, Chris. I remember that cover vividly and I even remember Bobbie Jackson. I remember that group interview and predicting afterward that hiring you to join our group of mostly introverts would mean a lot more talking in our office. You did not disappoint – in that or your passion for missions and for vividly teling the stories of those touched by God. I’m honored to have known and worked with you and all those you mentioned. Thank you, Chris. What a lovely tribute. And the time in India with you and Don was unforgettable — and still provides some of the funnest stories to tell nearly 19 years later. Praying for all our friends today. A department may be folding, but family forever stands — and the Lord and His love continues to compel us all. To God be all glory! Chris, thank you for this. I will always, always, always be indebted to Anita for taking a risk on someone like me who wasn’t old enough to even rent a car. Working in the comm. office was a privilege, and I am grateful for the people who “adopted” me, & invested in me as a person & writer. Goldie that was a great trip and so many great memories. What an incredible three weeks that has been one of the highlights of my life. Appreciated all the help we had on that trip. It was – and is a great group of folks Brittany, and it was great that you got to be a part of it. I believe all of us who went through that place with that group have been changed for the better. Wow, this was powerful just to read the names I’ve seen in print all of my adult life. Growing up in a church with no mission organizations and going to a college with no BCM (BSU as it was in those days), reading one issue of The Commission magazine that was devoted to the Journeyman program set me on the missionary journey of my life and extended into a career for 17 years. I devoured every word and photo of that issue. Thanks to all of you for how your giftedness impacted our lives. Moving tribute to an amazing group of folks. Janet that is awesome to hear. Would love to know what issue that was. I think I was even able to get in on the reporting of that. Regardless, it is awesome to always here the stories of how that magazine affected the lives of so many people. Thanks for commenting. Chris, you are too kind. It was an awesome experience with you through many years in a synergy that worked as long as it was valuable to those who invested in all of us. It was an era in Southern Baptist life that took its place in human history and in the scheme of God’s Unmatchable Providence, and I believe we gave what we had to be faithful to find every means our crafts afforded us to tell the story of the fallen and lost human condition nonetheless tempered by God’s revelation of Himself … and His redeeming all-empowering unimaginable Love and salvation personally to those of us from every culture and background who responded and became One in Him. That is the story of missions, and it can’t be hid, so if necessary even the rocks will sing it out long after we’ve all done our part. Thanks for your eulogy and sensitivity to these times now and to those of us who got caught up in them. It means a lot to me to be mentioned among such a distinguished and gifted group of great folks including yourself! Thanks Chris!!! It was my privilege to spend 2007-2014 as editor for those rock stars! What an impact each had on my life! Nicely done Chris. The week you and I spend in Honduras left a lasting impression on me. Could have done without the “bug” we both picked up our first night back in Panama, but that aside, still one of the best trips and stories of my career with a great companion. Great post and tribute to the people of the IMB Communications Dept. It was interesting to hear how God used them to shape your calling and your career. Thanks Nanette. They are a great group of extremely talented people who have for decades faithfully reported the work of SB missionaries. Definitely a cool fraternity to have been a part of. My heart aches reading this eulogy. The Commission has been eyes of all God is doing around the world since I was a very young girl. Now in my 70’s, I wonder just how we will share missions so vividly and knowledgeably as we could using The Commission! Thanks for reaching our convention and binding our hearts to a world needing Jesus! I was thrilled to read the names of you all who greatly impacted my and Jerry’s missionary calling and service in Hong Kong and Macau (24+ years). God used you and your work in ways you will never know. I vividly remember a photo from a story about Samburu people in The Commission Magazine. It gripped me and later we served among them for 13 years as church planters. We are now in Texas, having accepted the VRI. It’s a new day. We are praying for colleagues around the globe and in RVA. Wonderful tribute to The Commission, and some of the great people who wrote for it or took wonderful photos. Thanks so much. Does all this mean your mom and I “done good?” That is a great article. We are blessed to have gotten to know many of the great writers, editors and photographers that you mentioned. I remember Don Rutledge asking me if I knew the difference between a good amateur photographer and a professional. The answer was a pro has more film. I used to enjoy visiting with Mary Jane’s mom, Lucy, at the association office at Camp Cordova. We remember when you called from RVA and said “It’s time to put up or shut up.” That call resulted in us spending the next eleven years in Central America with the IMB. We probably would not have gone had it not been for all the stories by all the folks you mentioned above. All of you have been instrumental in pushing back the darkness and bringing light to some very tough places. As one of the “IMB 30″ and the one who has gratefully led many of the people of the IMB 30 over the years, I can say a very sincere thank you, Chris. This is beautifully penned and quite a tribute to my friends and colleagues who I love. While I am personally grieving that I will have to leave this organization that I have worked for nearly 22 years. I am probably saddest about my friends and colleagues who have QUITE LITERALLY sacrificed so much. They/we have been in war zones, disaster areas, captured people in extreme poverty, interviewed survivors of horrible wars like Kosovo, Iraq, shootings of our people in Yeman and on and on. They have sacrificed countless hours and given up holidays and weekends for the work of the Lord. But, perhaps the biggest sacrifice has been on time away from family and friends. Thank you for honoring all of us in this piece. Craig, brother, all that you said is so true. Every endeavor worth pursuing comes with a price, and it is a collective price if you’re part of a family. The time away was the biggest sacrifice for sure. But the trade off is the joy of giving voice to incredible people doing an incredible work for an incredible God. Thanks for your comments. Moving piece of writing Chris. Thanks for putting into words what so many of us are feeling these days. I came to the IMB in 2001, just two months before 9/11, after having been an editor at a daily, secular newspaper for nearly 19 years. I have never worked with a more dedicated, compassionate and talented group of people who truly cared for one another. It was such a big change after having worked in the secular world. There have been so many times during the past 14+ years that we’ve gathered to pray for our colleagues … those martyred in Mosul and Yemen, a former staff member turned missionary who was kidnapped, those with critically ill children, the many whose lives were ravaged by cancer … just to name a few. I never took for granted that we were allowed to pray at work or that we stopped once a week to corporately gather to worship our Lord. How I will miss that. Besides the talented group of folks that Chris has already mentioned I would like to add the name of Dan Beatty, my supervisor for the past three years as we collaborated on CommissionStories. He is one of the most passionate and gifted storytellers I’ve ever known and I have learned a great deal from him. I think I can speak for most everyone in the communications department when I say that our work at the IMB has not been a job but a calling on our lives. It has been such a privilege to be a part of telling God’s stories and how He is moving around the globe. My heart is broken that men have decided our work is done, but my prayer is that we will all find opportunities to continue creating and sharing incredibly powerful stories that inspire and challenge others. I echo your thoughts on Dan B. Sitting in a room with he and Rutledge while they discuss which images to use with MY story was like being the little kid with fishes and loaves listen to Jesus and God decide what miracle they were about to do. I probably learned more about story telling in that 90 minutes than the rest of my time combined. So, so beautifully written. This latest news saddens my heart, as it does for many others. I was heartbroken when Commission Magazine stopped being printed and delivered to my mailbox, but I was at least able to still click and stay connected to the stories and remember the world outside America. It was Commission Magazine and the amazing writings God used to show me His world, and how helped me to see how I could play a part and a world needed to hear the hope by which I live. I remember the first time I picked up a Commission Magazine, and read it cover to cover. I think it’s the only magazine I’ve ever read from cover to cover, and it was the token tool that God used to call me to missions and break my heart for the world. While I cannot begin to see how dissolving a communications department is the best move, when communication is essential for continued funding, prayer coverage, and the tool most vital to bring to life the needs around us. However, I trust that it was not a decision taken lightly, but covered in much prayer and sought after direction. That said, please know Chris and all your team, each and every one of you are instrumental beyond imagination. You are more than story tellers and photographers, you each played an intricate part to bringing others to Christ. Thank you for helping me know how to pray. Thank you for showing me, painting for me a vivid picture of the world, a lost world, around me. Thank you for showing me that I am valuable to Christ. Thank you for being used by God to help lead me to the mission field. Thank you for telling my stories. And thank you for helping me to be connected after I returned from the field. From one who’s gone before you, know that He is still at work. This is not the end of your story, or the end of Him using you for His glory. Be encouraged. I have been hurt and frustrated over this for my friends. And it got worse when I read the news release questioned ‘best possible’ stewardship comment giving the reason for firing the entire communication department. Your words and heart radiate the love, the grace and attitude that draws me to Christ. Too often we (me) try to drive a point home, educate someone or set someone straight. Not here, not in this letter. This struck me as a prayer. Again, thank you. John, I really appreciate your comment. I had to process through what to write because this action was very personal to me. Although I’ve not been part of that office for a number of years, I was fully invested and still invested by the people and their ministry to me personally and the impact they had in shaping my calling. They deserved better, but in this case, I felt they needed to hear they have been used by God himself to advance his kingdom and no man can take that away. Thank you for the tribute and the memories…after almost 40 years with the FMB/IMB the news of the action brought tears to my eyes…so many of us were influenced, educated and impacted to follow a leading to mission service and then supported and encouraged in our ministries by those to whom you so eloquently paid tribute. It hard to envision how the story of missions will continue to be told. Those of us who benefited from the work of these talented people have, I believe, an obligation to continue to tell the story whenever and wherever we get a chance. Chris: Thx for noting me, too. I an not sure what you learned from me professionally. I learned about me, however, by watching you. Though our time together spanned only months ad I recall, I recall my memories of you with fondness. And I will bever forget your advice on how to keep your luggage inspection time at an international airport brief, and that was to place ones “used” briefs and smelly socks, too, on top of all else. Classic, Chris. Wow. Just wow. I can’t claim to have the same connections and relationships with these gifted communicators that you have, but you captured their impact and the sadness of this situation perfectly and in such a positive way. Thanks for speaking for so many of us who grieve for our fellow communicators and who have also been touched by their work. Thank you for so eloquently sharing the loss. Thank you also because you honored the true purpose of the communications department.